What led you to MUSC as head of performance improvement? starting a new venture using lean and Six Sigma, and I was all in and applied. How does your military background apply to your career? me in the work I do in performance improvement at MUSC. 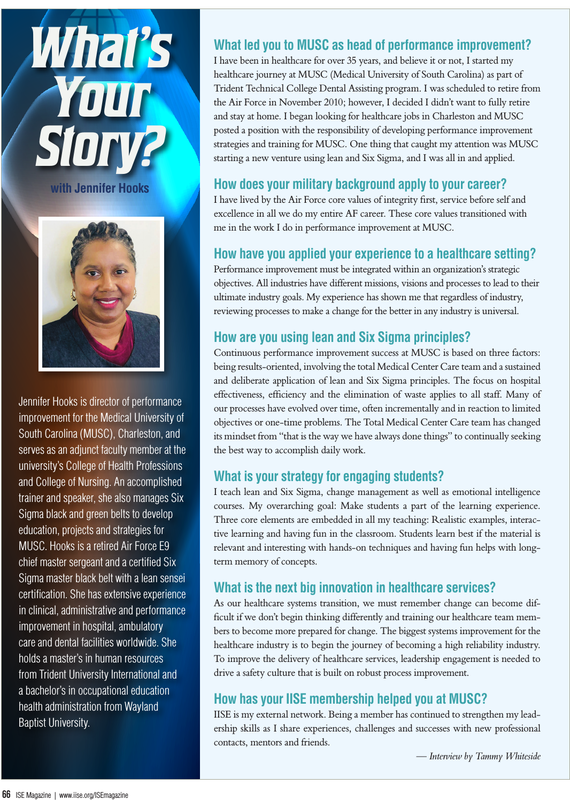 How have you applied your experience to a healthcare setting? reviewing processes to make a change for the better in any industry is universal. How are you using lean and Six Sigma principles? the best way to accomplish daily work. What is your strategy for engaging students? courses. My overarching goal: Make students a part of the learning experience. What is the next big innovation in healthcare services? healthcare industry is to begin the journey of becoming a high reliability industry. drive a safety culture that is built on robust process improvement. How has your IISE membership helped you at MUSC? and idea-wise at the IISE Annual Conference & Expo 2019 in Orlando, Florida. Early-bird savings end April 8.